The finding made by the environmental organization Sea Shepherd, on March 12, of the first specimen of a dead vaquita that was trapped in a fishing net within a refuge zone in the Upper Gulf of California, once again turned on the alerts for save the cetacean from the danger of extinction in which it is found, as a legacy of past administrations. The implications for Mexico of the extinction of the only endemic mammal in our country would be many and of serious consequences, such as the suspension of all international trade with endangered species of flora and fauna until a possible embargo on shrimp in the Gulf of Mexico . Researchers at the Institute of Biology of the National Autonomous University of Mexico (UNAM) agree that the critical situation of the porpoise was noticed in the administration of President Enrique Peña Nieto and years ago, “conservation programs could never reverse to its main threat: illegal fishing. ” They recognized that, although this could be the “last call”, the loss of the only marine mammal originating in Mexico can still be reversed, whose population fluctuates between 6 and 22 individuals, and with this, avoid a possible international embargo on products such as the shrimp, due to its incidental mortality as a result of totoaba fishing. And the furtive fishing of the totoaba – whose swim bladder is attributed miraculous cures, is used as a dowry or even as a financial investment – has decimated the population of vaquitas, which, being caught in fishing gillnets , they die asphyxiated. 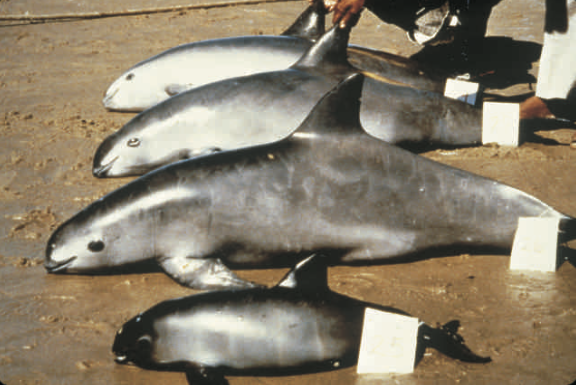 The researcher of the Maximum House of Studies, Rodrigo Medellín, confirms that the problem of the vaquita comes from previous administrations. “For 30 years we have the problem of the vaquita marina and today we have the last chance to save it,” he said. “It was a systematic oversight,” he said. He said that, although “we have the last call”, it must be clear that the porpoise can recover. An example of this, he said, is the black-footed ferret – he lives in the prairies of northern Mexico and the southern United States – which in 1960 had about 18 live animals in the world and today has more than 700 Or, the elephant seal of the north, a species that took refuge in Guadalupe Island, located in the peninsula of Baja California, of which in 1990 there were only 20 and now there are more than 200 thousand. “The cow has shown us that if we take away the pressure (illegal fishing), it starts to reproduce. Only in November 2018 two females and their offspring were found in the Upper Gulf of California, “added the assistant professor at Columbia University in New York. Medellin Legorreta, also an Associate Researcher at the American Museum of Natural History and the Arizona-Sonora Desert Museum, said that organized crime has permeated society to the extent of being behind poaching in that area. “The crime is behind the fishing of the totoaba and the vaquita has been the victim of it.” During the past six years, he added, it is estimated that the cetacean was reduced 85 percent, going from 200 copies in 2012 to less than 30 in 2017. Currently the population is between 6 and 10 copies, according to the International Committee for the Recovery of the Vaquita Marina (CIRVA). “It is not that the past administration did it well or did it badly, it is that the last administration was still doing some things. We have been requesting, asking and demanding, begging in some cases and in many ways, the attention to the vaquita, not only from the authorities but from many other sectors of the country, “he states. Also, “it’s not that the problem was something that started happening three or seven or ten years ago. More than 30 years ago we have the problem that the vaquita is in a clear decline and it is the moment in which today we have the last chance to save it. ” On the implications that the extinction of an endemic species such as the vaquita would bring to Mexico, it warns that there would be many and serious consequences. In principle, “the international community is going to take very severe letters in the matter with very serious implications for all Mexicans.” First, the Convention on International Trade in Endangered Species of Wild Fauna and Flora has already announced that, if Mexico does not do everything in its power to stop the extinction of the vaquita, one of the possible scenarios is to suspend all trade. international with CITES species “. “In Mexico we have thousands, thousands of Cites species, that is, threatened as the candelilla wax that is used for makeup, bile, shadows, etc. throughout the world. Candelilla wax leaves Mexico, “he says. In addition, there is the mahogany wood, the ornamental cacti, the orchids, the crocodile skins that benefit many Mexicans in rural areas, among others. “Everything is going to the rail!” He adds from London, where he is currently. UNESCO could remove to the Upper Gulf of California the name of a region considered a world heritage site because of its great biological richness, since endemic species such as the totoaba and the vaquita coexist, among others. And, “the other implication that comes is that in addition to gill nets of totoaba, shrimp nets are also killing vaquitas and already in the United States announced that if the vaquita dies a shrimp embargo will come”, which would bring serious economic effects for the country. He is also a researcher at the Institute of Biology of the UNAM. Gerardo Ceballos, without denying the efforts made in the last administration, said that it has been “the myopia” of the fishing authorities, which keeps the vaquita in the weak situation in which it is. “And it is that (the National Fisheries Institute (INAPESCA)”, has refused to use the fishing gear that would be compatible for the vaquita to survive and that the fishermen can continue with their work at sea, but for a stupidity They did not want to start this technique, “he said. “The current government, faced with the great pressure it has put on, has begun to make that effort. I think the only way would be to put an area of ​​exception in an area in the Gulf of Mexico, a zero zone, so that no vessel can enter, it’s the only way we could stop this. ” In the last administration, “efforts were made, but they were not enough. A lot was done, although not with the results that were wanted. Hopefully (in this government of President Andrés Manuel López Obrador) will continue working, “said the university researcher. On the support received during the last administration, he stated that there were also “a lot of corruption not only from the government, although there are many fishermen, we also have to be clear, they have done things well and they are demonized”. That is to say, there is a community of honest, correct fishermen who want the vaquita to be saved. “Obviously, there are also criminals who have carried much of the fundamental role in the incidental fishing of the vaquita, to obtain the swim bladder of totoaba”. Ceballos González, who has a degree in Biology from the National Autonomous University of Mexico (UAM), Iztapalapa campus, considered that a problem as timely as that of the porpoise, could have been solved in past administrations “if there was political and ethical will”. To do this, it must and should be attacked organized crime “in a harsh, strong, accurate and, on the other hand must have concertación of those who want to do things well, to be served in the right way.” “There is very little time, I do not think it would happen this year when it is extinct (the vaquita marina). We are already too late.